Big Ooops! While taking a bath, Henry tries to stop a drip of a drop with his little big toe. Now he's stuck in the tub and can't get out. And everyone who comes to help him makes a tub-boo-boo, too. Can they be rescued before they turn all pruney - and make the Evening News? 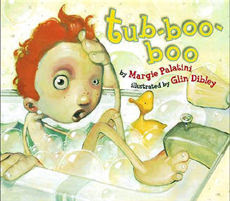 Margie Palatini's hilarious text and Glin Dibley's giddy art create a zany, zesty bathtime romp. I'm getting that book...it sounds so cute! Um, yea. Adding to that to my "books i need to buy" list.